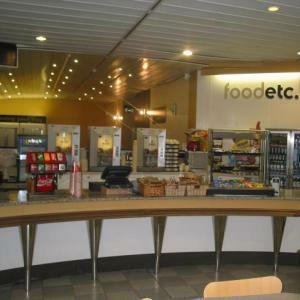 Relax and enjoy excellent food and drink in the comfortable surroundings of the foodetc. café. Located through the lobby behind reception, the café enjoys views of the leisure pool and has access to the balcony/spectator area for the lane swimming pool. A perfect location to socialise, relax and cool down after your workout or swim. With a superb menu and full range of drinks, snacks and a fully licensed bar you have every reason to be spoilt for choice. foodetc. has an excellent menu and special offers which provide a varied choice for everyone - from quick snacks, to healthy meals, to tasty food for kids. Look out for the seasonal offers and take out options at the café. The café has a private meeting room which can be hired out for parties and social events. Call 0114 223 3400 to find out more about our party options and 0114 223 3413 for meetings. Come leisure swimming at Ponds Forge for family swimming, kids swimming, and fun swimming in our leisure pool. The swimming pools at Ponds Forge are open for public swimming everyday. Karate is an excellent martial art to develop your discipline, coordination and self defence techniques. With commitment and determination, you could be the next Karate Master! Part of Sheffield International Venues (SIV), Ponds Forge boasts a 50m, 10 lane Olympic size competition pool, an Olympic size diving pool, a leisure pool, a 140 station gym, 2 dedicated fitness studios and a sports hall. Swimming provides a great low impact cardiovascular exercise, working almost every major muscle group in the body. It is also an effective means of relieving stress and a great way to unwind from the strains of the day. The active lifestyles programme provides discounted activity days with a wide choice of sporting and leisure activities. Prior to using the gym, customers must undertake an induction to learn how to use the equipment correctly. Fully refurbished 100station air conditioned gym includes: free weights, a vast amount of CVG equipment, resistance machines, cable jungles, stretch areas, consultation rooms, a spin room and a kinesis room. Courts in the sports hall are hired in 45 minute sessions - we recommend that you book your court in advance to avoid disappointment. It's great to learn a new skill, so why not try these coached sessions with our fully qualified staff at great prices. £3m refurbishment finished in June 2008, includes a new gym with over 100 stations, two new dedicated semi-sprung floor studios, new members changing rooms and spa and redecoration of The Leisure Pool. Home training venue of Some of the British Diving Team. The nearest motorway exit to Sheffield City Centre is junction 33 of the M1. This will bring you onto the Sheffield parkway and as you continue to head for the city centre, Ponds Forge is sign posted. Located at the end of the parkway the centre can be seen from the large (Park Square) roundabout. Ponds Forge is located extremely close to the City Centre. By Train: British Rail, Sheffield Station, Ponds Forge is less than 10 minutes on foot. By Bus: The Sheffield Interchange, Ponds Forge is less than 5 minutes on foot. By Supertram: The Supertram is also a reliable way of getting in and out of the City Centre, and Ponds Forge has its very own tram stop (Fitzalan Square/Ponds Forge), which nearly all routes pass. You can telephone 0114 272 8282 for more information. Accessible by Public Transport: Midlands Station, Sheffield station is 0 miles away.